Currently on exhibition at the guggenheim and getting rave reviews. I am going saturday and I cannot wait! "Cai Guo-Qiang is internationally acclaimed as an artist whose creative transgressions and cultural provocations have literally exploded the accepted parameters of art making in our time. 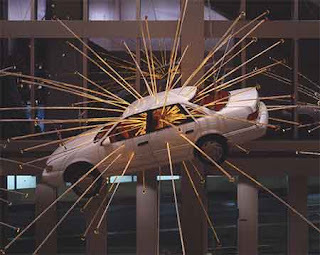 This is especially true of Inopportune: Stage One, Cai’s largest installation to date, which presents nine real cars in a cinematic progression that simulates a car bombing, occupying the central atrium of the Frank Lloyd Wright rotunda."